All but solidified -- Most NHL talent evaluators believed that the 2009 World Junior Championship would ultimately decide the No. 1 selection at the 2009 Entry Draft. It was seen as a battle between Canadian forward John Tavares and Swedish defenseman Victor Hedman. If that's the case, Tavares won't be waiting very long to head to the podium first at the Bell Centre in Montreal this June. The gifted center finished the tournament with eight goals and seven assists, leading his country to a gold medal as Canada earned a 5-1 win Monday against Sweden at Scotiabank Place. His efforts prompted him to be named the tournament's Most Valuable Player. "It makes it easier when the guys make you feel like you're just part of the group," Tavares said. "For me, it was just playing my game. I knew I'd get my opportunities. I knew I was counted on, but I never felt pressure to score a lot of goals or put up great numbers. It was just playing my game. I can say I gave it my all. I left it all out there." As for being named the MVP, Tavares is much happier with his country's fifth-consecutive gold medal. "It's an honor, but it's a better feeling being world champion," he said. Hedman nearly experienced that feeling. The 6-foot-6 defenseman has already drawn comparisons to the likes of Anaheim's Chris Pronger and Detroit's Nicklas Lidstrom. Tavares was impressed with what he saw, but June's draft was the last thing on his mind. "He's a good player, you can see that with his size and his speed and the way he reads the play," Tavares said of Hedman. "I just wanted to play my game in the team system. It was never about me. It was about playing for Canada." 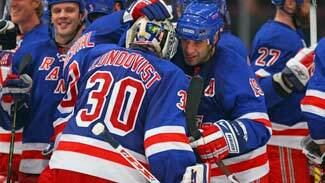 Feeling better -- After fighting off a stomach bug, New York Rangers goalie Henrik Lundqvist found his way into a column he hasn't been in since last season. After allowing 13 goals in his last three appearances, Lundqvist stopped all 27 shots he faced Monday night, leading the Blueshirts to a 4-0 victory against the Pittsburgh Penguins at Madison Square Garden. It was just the turnaround Lundqvist was looking for, as he struggled mightily as of late after giving up three goals or less in 17 of his first 18 games this season. On Monday, he recorded his first shutout of the 2008-09 campaign. It felt pretty good to Tom Renney, too. The Rangers coach was thrilled to see his No. 1 goalie get back on track. Meanwhile, Pittsburgh is fading faster than Macaulay Culkin. Despite having two of the League's best forwards in Sidney Crosby and Evgeni Malkin, the Pens have dropped five straight, six of seven, and seven of nine. When it comes to the Eastern Conference playoff race, Pittsburgh is now on the outside looking in. The most unbelievable statistic? The Penguins have only eight goals in their past seven games. Make it 13 -- When it comes to the New York Islanders, no lead is safe. They proved that again on Monday night. Despite jumping out to a 2-0 lead on goals from Kyle Okposo and Blake Comeau, the Isles saw their road losing streak extended to 13 games thanks to three unanswered goals by the Edmonton Oilers. Andrew Cogliano broke a 2-2 tie midway through the third period. New York, which has the worst record in the NHL (12-25-4), has dropped 15 of its last 17 games. "That was a winnable game and it slipped away from us," Isles captain Bill Guerin said. "Give them credit, they hung in there too. It was one of those games where whoever's going to stick around longest and not break, and catch a break is going to win and that's what happened." Islanders coach Scott Gordon was less than thrilled with the officiating. New York went 1-for-2 on the power play, while the Oilers went 0-for-3. "We didn't obviously get any calls," he said. "Tim Jackman goes in, which should obviously be a power play for us, doesn't get the call. They go opposite end and Joey (MacDonald) gets run, no call. A goal gets kicked in, they rule it didn't get kicked in. It looks like it was kicked in to me. We played a good game." But if the Islanders come up short in Calgary on Thursday, they will move within one loss of matching their franchise-worst 15-game road skid, set during 1972-73. So, Mr. Tavares, how do you feel about Long Island?